Designing an efficient cipher was always a delicate balance between linear and non-linear operations. This goes back to the design of DES, and in fact all the way back to the seminal work of Shannon. Here we focus, for the first time, on an extreme corner of the design space and initiate a study of symmetric-key primitives that minimize the multiplicative size and depth of their descriptions. This is motivated by recent progress in practical instantiations of secure multi-party computation (MPC), fully homomorphic encryption (FHE), and zero-knowledge proofs (ZK) where linear computations are, compared to non-linear operations, essentially “free”. We focus on the case of a block cipher, and propose the family of block ciphers “LowMC”, beating all existing proposals with respect to these metrics by far. 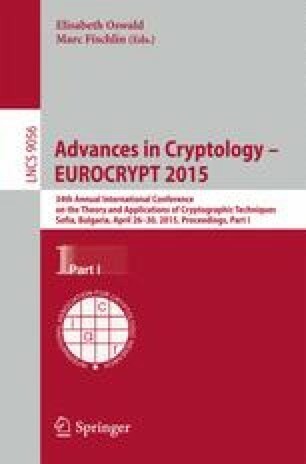 We sketch several applications for such ciphers and give implementation comparisons suggesting that when encrypting larger amounts of data the new design strategy translates into improvements in computation and communication complexity by up to a factor of 5 compared to AES-128, which incidentally is one of the most competitive classical designs. Furthermore, we identify cases where “free XORs” can no longer be regarded as such but represent a bottleneck, hence refuting this commonly held belief with a practical example.